TravelpharmCelebrations & TraditionsWhat Happens On Burns Night? When is Burns Night? What happens during the supper? What is the Burns Address? All your questions AND MORE answered here! Robert Burns Day (or Burns Night) is held, traditionally, on January 25th every year to celebrate the birthday of Scotland’s ‘national poet’. As well as being recognised as one of the greatest poets of all time, he is also a Scottish hero because he used his works to draw attention to class inequalities, poverty and other social injustices. Burns won a public vote to become ‘The Greatest Scot’ of all time. His influence was felt around the world, with monuments in his honour erected in Canada and America. The most famous, however, is located in Leith in Edinburgh, Scotland. So now you know a little more about the man which the day is based around, what about that iconic culinary dish, the haggis. This links back to ‘Address to a Haggis’, a poem written by Burns and since then the two have been forever associated. While many families will simply sit down to the traditional ‘haggis, neeps (swede) and tatties (mashed potato)’ – If you want to have a more traditional Burns Night supper then there is a little more ceremony involved. To begin with, a piper will play in the guests to the dining room. The host of the meal will welcome their guests before the first course of soup or broth is served. Once the soup course is finished the piper will once again pick up his bagpipes and ‘play in’ the haggis as it is brought into the room. The host will then perform the ‘Burns address’. After the poem is completed, the haggis is cut and a toast is made. After the meal, various toasts and poem readings follow, before the ceremony closes with all the guests join hands and sing Auld Lang Syne. 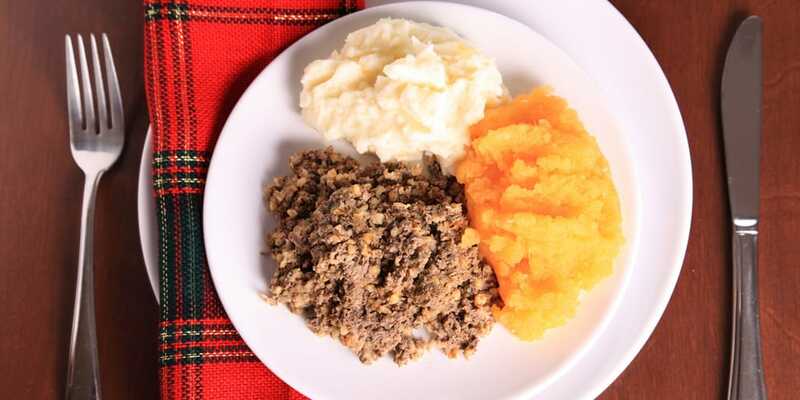 Are you having a Burns Night supper? Share your photos in the comments.